I made the Hearty Lentil Soup for supper and it is delicious. My thanks to Laura for sharing the recipe! I made some changes, leaving a few things out, and also added ham to the soup. The changes I made are shown below in bold. My version probably makes more than Laura’s as I used more tomatoes, more chicken stock and more lentils. The soup can be made in one pot, which I like. Not much clean up. Fry bacon in large stockpot or Dutch oven over medium-high heat, stirring occasionally, until fat is rendered and bacon is crisp, 3 to 4 minutes. Add onions, celery, and carrots; cook, stirring occasionally, until vegetables begin to soften, about 2 minutes. Stir in tomatoes, bay leaf, dry onion, and thyme; cook until fragrant, about 30 seconds. 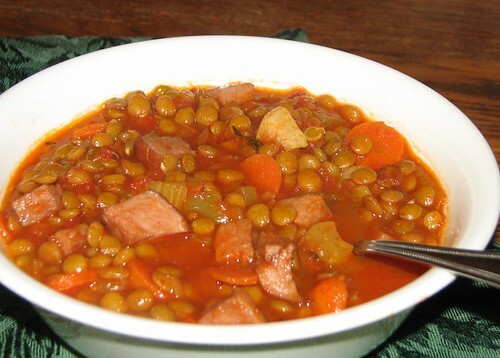 Stir in lentils, ham, salt, and pepper to taste; cover, reduce heat to medium-low, and cook until vegetables are softened and lentils have darkened, 8 to 10 minutes. Uncover, increase heat to high, add wine, and bring to simmer. Add chicken broth and water; bring to boil, cover partially, and reduce heat to low. Simmer until lentils are tender but still hold their shape, 30 to 35 minutes; discard bay leaf. Puree 3 cups soup in blender until smooth, then return to pot; stir in vinegar and heat soup over medium-low until hot, about 5 minutes. Stir in 2 tablespoons parsley and serve, garnishing each bowl with some of the remaining parsley. The balsamic vinegar is a great addition to this soup, adding wonderful flavor. I also liked the addition of the ham, but you can certainly leave that out, if you prefer. This entry was written by ~~Rhonda, posted on January 19, 2010 at 8:08 pm, filed under cooking, Recipes and tagged cooking, hearty lentil soup, lentils, recipe, soup. Bookmark the permalink. Follow any comments here with the RSS feed for this post. Post a comment or leave a trackback: Trackback URL. Just because I am puzzled…. your husband is allergic to onions so you don’t use fresh ones…but you can used dried ones? Isn’t he still being exposed to onion?